An accepted drawback of being a problem manager, if you could call it that, is the fact that your efforts seem to go unrewarded when you compare it to the incident manager for example. It is possible that in a meeting where you are reviewing a recent major incident that you begin to daydream that you are in a large vaulted ceiling cavern. At the far end of the space you see the idol (root cause) you have long been searching for. Carefully making your way to the front of the room, negotiating over several traps you reach the idol which sits upon a stone pedestal. As an expert at situations like this you pull out a small sack and fill it with sand to match what you assume the corresponding weight of the idol is. With one swift motion you swap the sack with the idol and have it firmly in your grasp. It is then that the stone pedestal begins to drop and this sets off a chain reaction. You begin to hear a loud, deep rumbling sound which makes the hairs on your neck stand up. You know that it is time to escape. Running back through the trap area you make your way out into the corridor where behind you a gigantic bolder is crushing everything it comes into contact with. As you reach the end of the passage way you leap to narrowly avoid being crushed yourself. 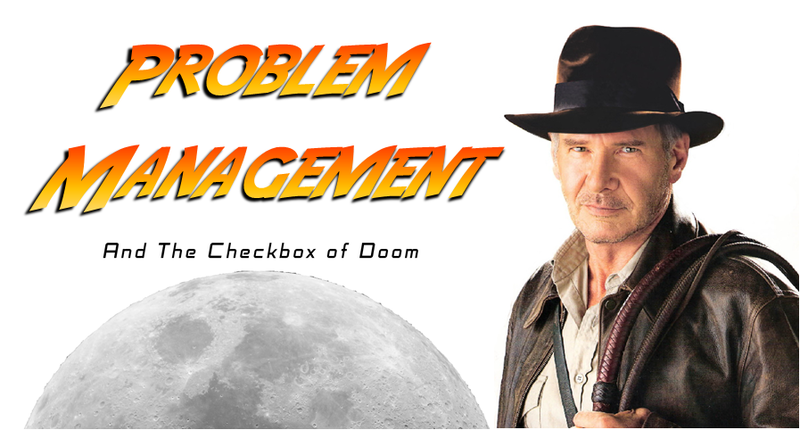 Snapping back into reality you remember that problem management is not this dramatic, however, root cause analysis can have a similar cause and effect. Think about it in these terms. You have a business critical application that has a particular function which is not working consistently. While this particular function may not seem business impacting since it initially has only happened briefly a few times a month. It is now happening more often and for longer durations. To your knowledge there were no changes that could have impacted the application in a negative way but you can’t seem to get your head around how it was working before and now seems to not only be getting worse but it seems to go away without intervention. After some initial investigation it appears to have been an oversight in a backend setting of the application. It is a checkbox that needs to be unchecked. Much like the dramatization above your excitement peaks as you clutch for the idol (root cause). Beware however that this could inadvertently trigger a boulder to chase you through the cavern. A good understanding should be established on what that checkbox does and why the issue has arisen now. Don’t be too quick to swap the idol for the sand until you understand what the outcomes of that decision might be. While the checkbox might appear to be the root cause, the reason that the checkbox is impacting the system now is a deeper dive in to what is really causing the issue. Once you know that, you can get this tested out and confirm the results without fear of further impact.